2P START! Live! : April Fool's Edition | 2P START! We sure fooled you guys by releasing the podcast on Tuesday instead of Monday! You should have seen the look on your faces! Anyway, enjoy this longer edition of 2P START! Live! as we take your advice and chat away for a good 30 minutes. Enjoy! Hey Ray, got those boss battles on very hard and intense trophy’s yet? Nice podcast guys. Fun times as always. And good catch, Tim, about the Black Doom Award. I was briefly worried that I wouldn’t get my weekly fix of Mystic Cave and Doomsday Zone. That was close. And I don’t have a guess about the Trivia for You this time. I have no clue. Even Ray doesn’t understand the 2p Start jokes. Seriously, I want a Chaos Emerald award. I was mentioned as a joke! That gives me an awesome point! I just listen to them, I’m only gonna listen to them once anyways so no need to download. Anyhow, about Professor Layton’s downloads – I was wondering how they would keep them in the game anyway. You can’t just save whole bunches of data to the game cart – most of it is read-only memory! I’d bet that only 64 kilobytes are writable – no where near enough to download and store a puzzle (graphics + puzzle code…), let alone several. It makes sense to do the unlocking thing. Trivia for you is from Mr. Game and Watch 64! . I wanna play Ray on Brawl!!! T_T . When are we gonna play Ray? All my Brawl comments are metal songs. “be quick or be dead”, “heaven can wait”(both iron maiden), “fade to black”(metallica), and “revenga”(system of a down); I like having themed comments . Ya’ll could’ve done an “off” podcast for April Fools >.> …..Why don’t ya’ll do “name that game” every friday? Did anyone else notice the cool new end music? And good luck with the job Ray! This was a really good length. Long enough to cover all the topics thoroughly, but not drawn out either. Great episode, guys. The highest difficulty I’ve cleared Boss Battles on is “Very Hard,” but I did clear it with every character, as well as Home-Run Contest, Classic, All-Star, all five Target Tests, and 100-man Brawl. I think I have about six windows left to break in the Challenges section now….. I myself was also contemplating the music’s origins. The 2P START! Theme Music is something we’ll talk a bit more about in the next episode of the podcast. Glad to hear you guys enjoy it! 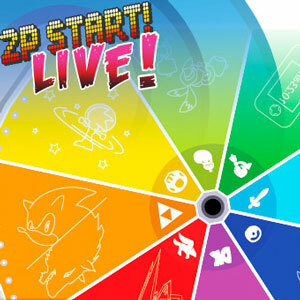 I looked closer at the wheel after hearing that and notice one on the left with the Fire Emblem symbol, imagine getting Bioware or, maybe Intelligent Systems making a Turn-Based Strategy Sonic game.